Today, 24.6 per cent of the world’s population is aged between 10 and 24. Almost nine out of ten live in less-developed countries. In many countries, youth populations make up over half or even two-thirds of their total: 56 per cent of the population in Guatemala is under the age of 25, 63 per cent in Afghanistan, and 67 per cent in Mali. But if you’re young, your voice isn’t fully heard in your family, community or nation: all too often, you’re expected to defer to older people and have your decisions made for you. Down the ages, both young women and men have questioned this, challenging injustices, championing change, and asserting their right to play a full part in shaping today and tomorrow. During the past decade alone, young activists have agitated for change through powerful social movements including the global Occupy Movements, the Arab Spring, the Umbrella Revolution in Hong Kong, Los Indignados in Spain, Y’en en marre in Senegal, le Balai Citoyen in Burkina Faso, and Lucha in the Democratic Republic of Congo, to name just a few. In these movements, young women are to be found alongside young men, agitating for change. But in a world where (older) men are still seen as natural leaders, the sight of young women marching on the streets, demanding space and voice, is too much for many. Their bravery is often punished through violence, harassment and abuse – not only from the men who oppose them, but from men ‘on their side’. And that’s why young women need feminism. In their article on young women activists in Myanmar, Agatha Ma, Poe Ei Phyu and Catriona Knapman explore their experiences and emphasise the courage it takes to step out of the submissive role young women are expected to take. Young feminists are adopting innovative strategies to push back against resurgent patriarchal power, challenging social norms about female submission and passivity, outing sexual violence while holding perpetrators to account, asserting sexual and reproductive rights, and campaigning for political, economic and social empowerment. And young feminists are committed to living their values. In their article, Devi Leiper O’Malley and Ruby Johnson of FRIDA/Young Feminist Fund explore what they call a ‘young feminist new order’ – exploring why young feminists work the way they do. Young feminists see themselves as part of a wider movement for social justice, aware of the importance of inclusivity and intersectionality. Their work is about challenging the dominant, hierarchical power that’s familiar the world over. They’re calling for a radically different world founded on principles of participation, empowerment, collaboration, power-sharing, and feminist leadership. What’s the main message of this issue for international development policymakers and practitioners who want to learn from young feminists? It’s about getting young people, and young women in particular, into the driving seat of development. In her article, Rosie Walters focuses on a North-South development project focusing on ‘girls’ to deliver development. Yes, young women need education and economic opportunities. But what’s also needed is real change at a legal and political level to enable young women to flourish and challenge boundaries without taking extreme risks. Rosie’s case study shows young women – in both South and North – subverting development and shifting it up a gear, putting feminism at the heart. Young feminists are fighting against the odds and finding a way through. Picture credit: UN Women/Sahand Minae. 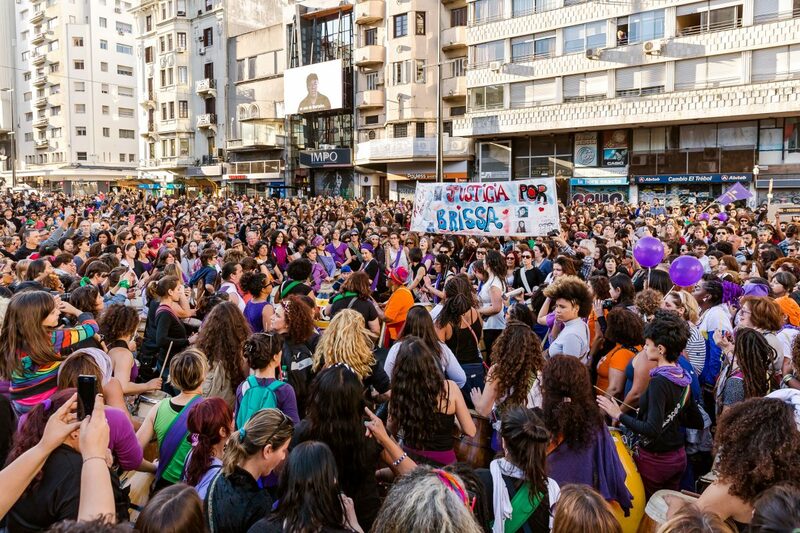 Young women march to end violence against women in Montevideo, Uruguay, 2017.